Video: Jason Redman on Fox & Friends. 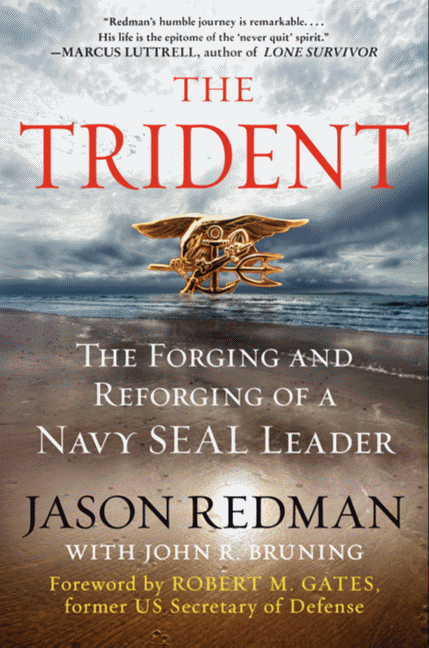 Former Lieutenant Jason Redman, who spent eleven years enlisted as a Navy SEAL, gives a highly-charged account of his combat missions in Iraq and his miraculous recovery from wounds that might have killed him in The Trident: The Forging and Reforging of a Navy SEAL Leader (William Morrow). In this intense and unforgettable story of grit and determination, Redman explains how it is possible to overcome adversity, no matter the cost. A popular speaker for schools and universities, community events, corporations, and veterans’ organizations, Redman regularly speaks to audiences across the country about motivation and leadership. During his military career, Redman was deployed to Columbia, Peru, Afghanistan and Iraq, where he served as a team assault force commander. In western Iraq alone, he conducted forty capture-kill missions with his men and captured more than 120 Al Qaida insurgent leaders and fighters. But the high-stakes of combat are only part of his story. 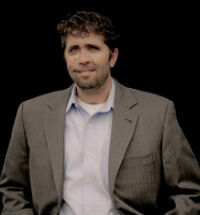 In September 2007, while leading a mission against a key senior Al Qaida commander in Iraq, Redman’s team was ambushed and he was gravely wounded. Shot twice in the arm and once in the face, Redman nearly died on the battlefield. 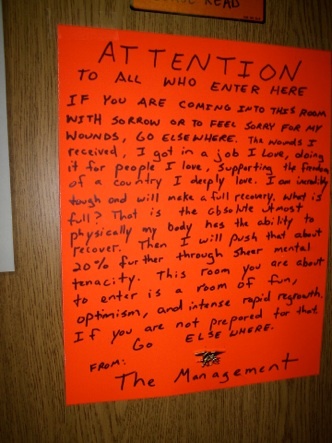 During the intense recovery that followed—a process that took years and included 37 surgeries and 190 hours under general anesthesia—Redman earned national media attention when he posted a sign on his door at Bethesda Naval Medical Center, telling all those who entered to not “feel sorry for my wounds.” The sign became both a statement and a symbol for wounded warriors everywhere. It also earned him an invitation to meet President George W. Bush at the White House and still hangs there to this day. Redman has received numerous honors and awards, including the Bronze Star Medal with Valor, the Purple Heart, the Defense Meritorious Service Medal, the Navy Commendation Medal, the Joint Service Achievement Medal, five Navy Achievement Medals, and two Combat Action Ribbons. A graduate of Old Dominion University, Redman was recognized in November of 2009 with their prestigious Alumni Service Award in recognition of exemplary leadership and significant, compassionate service to community, state, and nation. He was also the 2010 recipient of the Hope for the Warriors, Hope and Courage award. Now retired, Redman has since founded Wounded Wear, a non-profit organization designed to help wounded warriors, their families, and families of the fallen by providing free clothing and clothing modifications as well as hosting empowering events. Redman continues to share his motivational story of how he struggled to find the balance between bravery and bravado and survived a near-death experience and subsequent recovery. He lives in Virginia with his wife, Erica, and their three children. "I am at a loss to describe how much Jason and his discussion resonated with our group. Jason has an amazing story and he charmed the audience. Finance people have an unwarranted reputation for being a bit cold and hard hearted. Jason proved that wrong. He touched everyone not only in the room but in the subsequent discussions he had. " "Jason’s message is moving and powerful. He kept the audience fully engaged during the entire program. Jason took time to talk with me prior to our event to get to know our membership’s wants and needs. He couldn’t have been easier to work with. A true professional, gentleman and hero."